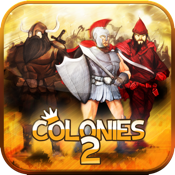 Colonies 2 is a fast paced real time strategy game where you command armies from 4 different empires. The goal is to start colonies in all the spots available on the map and conquer all other civilizations towns. To start a new colony in an empty town spot you select one or more of your own towns and then an empty town spot. You select a town by tapping on it. You deselect a town by tapping it again. Manage your resources! Build more houses to increase your towns population. As you have more and more peasants, you can mine for more gold that you use to build more houses, barracks and fortify your towns. Barracks increase your soldiers numbers. This is where peasants train to become soldiers. Each town starts with a barracks and you can build an additional one to train more soldiers. Fortify your town to resist attacks. A wall will surround your whole town. Walls can decimate an army before it comes into town, saving your peoples lives. Be careful not to let your towns with to few soldiers and peasants or your colony might be taken over by another empire. You win when the colonization process ended and you occupied all the towns on the map. Play with Vikings, Romans, Mongols and Maya. Colonies 2 has 30 different maps playable with each empire. The first 6 maps are free, the rest are unlocked by purchasing the full version of the game. As you progress in your campaign the maps become more and more difficult. Luckily you can cheat by changing your difficulty setting in each map. Each battle takes place in a magnificent scenery, with mountains, lakes and forests.